CD, 1 track, 53 minutes. When Guy Debord’s publisher, Gerard Lebovici, was assassinated on March 5th, 1994, Debord resolved never to allow his films to be shown again in France. This murder was no coincidence, he was sure, but a matter directly attributable to the clandestine forces in existence within the French State – forces similar to neo-fascist groups in Italy or death squads in El Salvador. His highly innovative attempts at theoretical film threw down a challenge that has not yet been taken up, despite all the time that has since elapsed – only one small group from the US, using video, have tried a similar theoretical critique of the modern world in Call it Sleep. That is, until now. Oregon-based Guy van Stratten has continued in this line. In his film agents with false memories he has also used a plagiarism of images to form an accumulation of détourned elements taken from advertisements, newsclips and cinema. This ‘cut-up’ technique was also applied in the making of the soundtrack with the assistance of Richard H. Kirk in February, 1996. What you are about to hear is a live accompaniment to the existing visuals made at Western Works Studios in Sheffield. This CD was released in association with Soleilmoon Recordings. 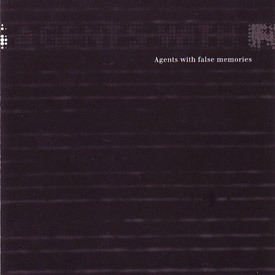 ‘Agents With False Memories’ (sounds like a phrase Marshall McLuhan might have coined) is an engaging and threatening hallucinogenic trip through broadcasting media. It’s a bit like Dicky, armed with (sometimes grossly overloaded) delay, an artillery of analogue sounds, breakbeats, some fat Kirkian drum programmes and some (possibly) prepared tapes of radio/tv quotes went into his studio and jammed for a while finally arriving at 55 minutes of suitable material. Mongers of arms rub shoulders with the operatics of soap in an exercise in recontextualisation which makes even Blue Peter sound like part of an international conspiracy. Voices of angels, both dark and light, dispense (mis)information…their forked tongues flicker in and out of shiny, moonlit pools of tv-induced alpha-awareness. Richard’s preoccupation with digital media and surveillance crops up repeatedly and there is much to discover in this multi-layered exploration of our media environment. Probably extremely disturbing if you’ve had several mikes too many of lie-surge icky-acid…and I would recommend checking out Stefan Tischler’s CD ‘Excess Of Free Speech’ released on Extreme some years back…beatless but full of similar information.